I, Pawan Kumar (Black Belt 4 Dan) director of the gym am very great full to Master Satwinder Vohra (Black Belt 8 Dan), who specially came from UK to attend a Free workshop at Rose Rock Taekwondo Gym on Sunday dated 6-4-2008. More then 150 students participated and learnt very useful techniques of Martal Art, Taekwondo & Karate. This type of workshop gives the students best of knowledge and students enjoyed this workshop especially Master Vohra’s friendly attitude. This was the second successful workshop by Mr. Vohra and in future it will be continuous. All the students, their parents and Director of the gym appreciated Master Vohra’s job. We committed that in future this type of workshops will be continuous. We wish Master Vohra well in future endeavors. Having been involved in Taekwondo for the past 13 years from beginner to instructor level, I have met many students, instructors & masters of Taekwondo. 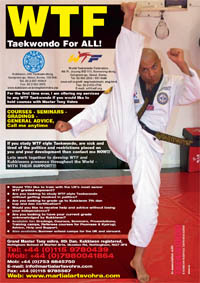 It is always a privilege to meet practitioners who encompass Taekwondo as a martial art & not just a sport. Having been introduced to the disheartening world of politics in Taekwondo as a student & in more recent years as a club instructor, I’ve found it increasingly frustrating trying to run my club without my students feeling any ill effects from this. Surely we all want the same thing don’t we? If people decide to come together as an organisation for clubs to link & pay their fees to, then surely the organisation should strive for an efficient & helpful service with open communication. Instructors & students should feel comfortable approaching these Masters of Taekwondo or secretaries & feel assured they will receive the support & response of these people as hoped. Having recently become more & more disheartened with the politics within Taekwondo, I felt I needed some respite from this situation. 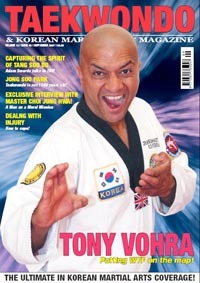 A fellow student from times past mentioned Grandmaster Vohra; an internet search later led me to martialartsvohra.com. What I read appealed to me instantly - his credentials & vast experience made for interesting reading & there didn’t appear to be any political spiel attached. I emailed him and was surprised at the speed of his response only a few hours later. He offered to come up to Bingley, West Yorkshire & meet with me the very next day. Upon meeting Master Vohra I instantly found him to be very approachable, helpful, humble & polite in his manner. Following discussions, students at Strike Taekwondo club were invited to train at Master Vohra’s Academy of Martial Arts in Nottingham. So, Thank you TKD-KMA because without you we would be none the wiser.